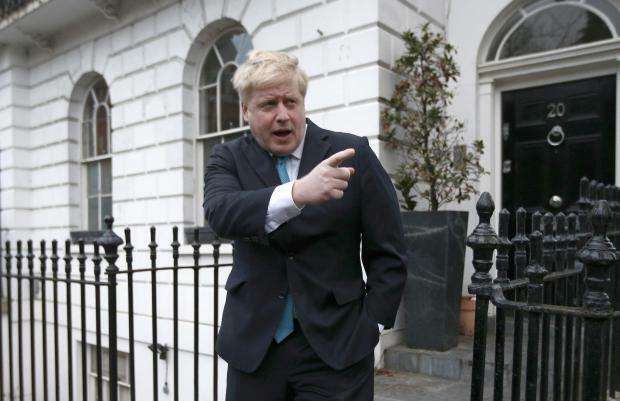 Boris Johnson is campaigning against EU membership. UK companies rushed to hedge their currency exposure today, pushing up the cost of protection against sharp price swings to its highest in over four years, as concern grew that Britain will vote to leave the European Union. Those campaigning to leave the EU got some help yesterday, when London Mayor Boris Johnson announced he would back them. Bookmakers are now giving better odds that Britain will leave, and Citi, a leading foreign exchange player, has upped the risk of "Brexit" to 30 to 40 percent from 20 to 30 percent. "There was a strong reaction from UK corporate treasurers this morning as they come to terms with the possibility of sterling losses in the coming months," said Richard de Meo, a director at Foenix Partners, a firm that offers hedging to mid-and small-size UK companies. "Those who can wait believe in a rebound post-referendum on the assumption that Britain will remain in the EU, but short- term needs are being hedged at current levels." The six-month implied volatility in sterling/dollar - used by investors and many companies to hedge currency exposure, and a gauge of how sharply the currency is expected to move - rose to 12.2 percent, its highest since late 2011, according to Reuters charts. The contract captures the date of the referendum, scheduled for June 23. The six-month sterling/dollar risk reversals - a gauge of demand for options on a currency rising or falling - indicate the bias towards sterling weakness is at its highest since late 2011, according to Reuters data. In the spot market, sterling fell to a seven-year low of $1.4057, down 2.3 percent and on track for its biggest daily loss in nearly six years [GBP/]. "Our corporate desk is seeing more hedging being put on by corporates who have sterling exposure," said Jacob Nell, UK economist at Morgan Stanley. The euro was up 1.2 percent at 78.30 pence with some now expecting the single currency to gain in coming months to 80 pence. "In our view, euro zone-based clients should maintain a high short-term FX hedge ratio on sterling risks," Dankse Bank, a large Nordic Bank said in a note.